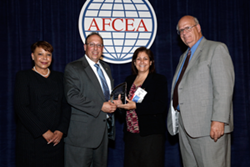 NT Concepts was honored by AFCEA International on June 23rd with the first ever Small Business of the Year Award. Recognizing their commitment to the mission, values and activities of the Armed Forces Communications and Electronics Association (AFCEA), NT Concepts was presented with the Small Business of the Year award at a widely attended ceremony in Baltimore, Maryland. This award is evidence of demonstrated excellence in client service, business practices, staff training and motivation, and community/professional outreach. Next Tier Concepts, Inc. (NT Concepts) delivers data analytics, software engineering, and geospatial solutions, coupled with skillful professional services, to enable our customers’ success. Our approach integrates leading technologies, proven best practices, and deep expertise to produce innovative solutions and services that drive operational efficiency and inform critical decision making. Founded in 1998, NT Concepts is a woman-owned company with customers spanning the Federal Civilian, DoD, and Intelligence Community markets. AFCEA (Armed Forces Communications and Electronics Association) is an international organization that serves its members by providing a forum for the ethical exchange of information technology, communications, and electronics for the defense, homeland security and intelligence communities. It is comprised of over 35,000 individual members and 2,000 corporate members located around the world.